Buy Classic Volks – Classic Volkswagen Jetta for sale in Suisun City, California. As shown here is VW Jetta MK1 4-door sedan released in 1983 powered by gas engine mated by manual transmission with only 37153 miles on it. All looks good for its age, it could be perfect start to restored that was offered in Craigslist looking for $4990. This entry was posted in 1983, For Sale, Jetta, USA, Volkswagen and tagged Volkswagen Jetta on January 6, 2017 by buyclass. 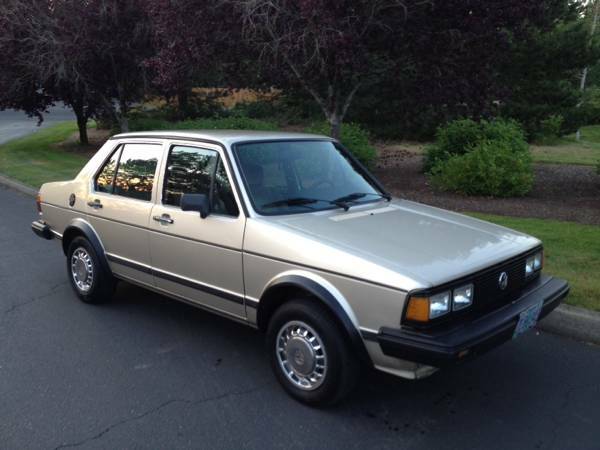 Buy Classic Volks – found this one remarkable example of the first generation VW Jetta well-known as Jetta MK1 fairly nice 4-door sedan body, very clean inside and out reportedly only 101,000 miles on it and still in original condition. Posted by its second owner, that’s could be a cleanest Jetta being offered for sale in here today. This entry was posted in 1984, For Sale, Jetta, USA, Volkswagen and tagged Volkswagen Jetta Diesel on November 21, 2016 by buyclass. Buy Classic Volks – Volkswagen Jetta for Sale in San Gabriel, California. As you’ve seen here is 1984 VW Jetta MK1 Sedan powered by turbo diesel mated by manual transmission with only 184K miles on it. As you’ve seen here is could be a perfect example to restored it being offered in Craigslist looking for $5500. This entry was posted in 1984, For Sale, Jetta, USA, Volkswagen and tagged Volkswagen Jetta Diesel on October 10, 2016 by buyclass.